Taking a cue from the famous John Denver song and Aspen resident, follow the Roaring Fork Valley’s roads and feel right at home in one of Colorado’s most vibrant and inspiring landscapes. The Roaring Fork Valley is a natural lure for artistic talent—it’s like bees to the hive. As a visitor, you get to be the butterfly—taking it all in as you flit from place to place exploring the arts. The Aspen Art Museum is a good place to start. It’s edgy, and everyone has an opinion about it; what’s yours? There are also shows and exhibits galore—be sure to check out the Glenwood Vaudeville Revue for comedy, Thunder River Theater Company for more erudite offerings and The Temporary for an eclectic array of performing arts. Up and down the valley, you’ll find galleries that showcase everything from oil paintings to pottery. Breathe some fresh country air. Visit the Maroon Bells or hike lesser known trails, but take time to commune with nature. For bikers, paved trails like the Rio Grande span the distance from Aspen to Glenwood Springs and dirt rides include Red Hill and Prince Creek in Carbondale, and Wulfsohn and Grandstaff in Glenwood Springs. For the ultimate biking thrills, ride the lifts at Aspen Mountain and Snowmass, then cruise downhill on your bike, or just ride the Silver Queen Gondola for the views. In winter, stay in Glenwood Springs where lodging is always affordable and make tracks to ski and ride the nearby, world-famous slopes of Aspen, Snowmass, Aspen Highlands and Buttermilk. Sunlight Mountain Resort is Glenwood’s hometown hill for a more low-key ski experience. Be a smarty pants just because. At Rock Bottom Ranch, with campuses in Basalt and Aspen, you can learn about birds of prey, go on farm walks and even do yoga in nature; in winter take guided snowshoeing tours to historic Ashcroft. History buffs can go back in time with a guided tour of the Hotel Jerome in Aspen, built in 1889, during the town’s silver mining heyday. In addition to hiking to his grave marker at Linwood Cemetery in Glenwood Springs, the new Doc Holliday Museum allows visitors to learn more about the famous gunslinger’s life and times. On your way back to Glenwood Springs from Aspen, take a detour along the valley’s back roads. From Catherine’s Store on Highway 82 take County Road 100 west into Carbondale. You’ll see ranch lands and rodeo grounds roll by. The blacktop will morph into Main St. in Carbondale, Glenwood’s charming neighbor to the south. At the roundabout at Main and Highway 133, continue straight, past the 7-11 and City Market. Follow County Roads 106 and 108 to Dry Park Road (County Road 125) to Glenwood Springs for a quiet countryside drive. Keep in mind, Dry Park Road may not be drivable in winter. 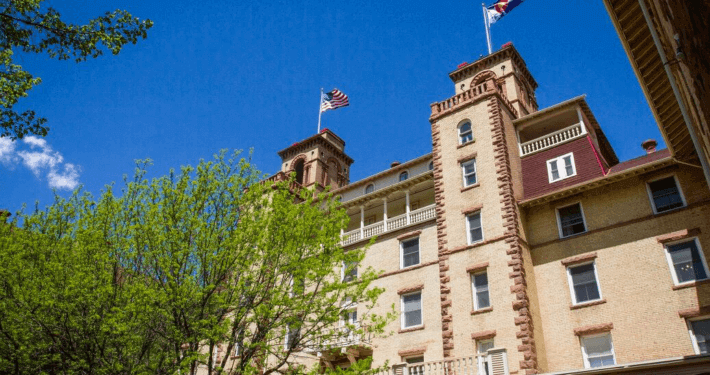 At the end of the day and the end of the road, you’ll arrive back in Glenwood Springs, just in time for a meal, a drink and a soak in the hot springs. Find great eats throughout Glenwood Springs; there’s something to please every palate. Before turning in for the night, relax Glenwood Spring-style in the town’s hot springs amenities: The Glenwood Hot Springs, Iron Mountain Hot Springs or the Yampah Spa & Vapor Caves. To quote John Denver’s famous song Country Roads, “And drivin’ down the road I get a feelin’ that I should have been home yesterday, yesterday.” Well you’ve arrived. Welcome to Glenwood Springs, your home away from home.